We are big rice eaters in our family. We probably would be fine eating it just about every day. The trouble with making rice is that it takes about 20-30 minutes in the rice cooker to have a batch of rice to eat. If you try to make more and refrigerate it, it gets dried out and not as palatable. Rice N Simple has single serving rice that is already cooked, and only requires one minute in the microwave. No refrigeration is necessary. 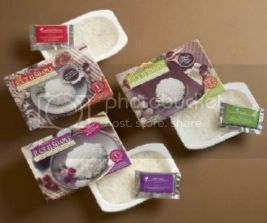 Rice n Simple offers all-natural, premium cooked rice that raises the standards for instant microwaveable meals. It cooks in just one minute and the various sauces that come with each bowl are exceptionally delicious! Available in both white jasmine rice and brown rice, Rice n Simple has created super healthy rice meals with incredible sauces that add mouthwatering taste to its already flavorful rice. And at a very affordable price, Rice n Simple provides quick & easy, yet super healthy rice bowls. The rice itself is of the highest quality, imported from Thailand and selected for its delicious flavor, unique texture and naturally distinctive aroma. With delicious sauces including naturally brewed Soy Sauce, lush Shiitake Mushroom Glaze and a sophisticatedly flavored Teriyaki Glaze, the rice can also be utilized in any recipe. Rice continues to be valued as one of the most nutritious foods for a healthy lifestyle, however, cooking perfectly steamed rice requires the combination of quality rice, the accurate measure of water and precise cooking time. Rice n Simple’s all-natural, microwaveable rice meal components eliminate the complexity and allow the home cook to relax and indulge in delicious 5-Star Restaurant quality rice in just one minute of cooking time. Rice n Simple’s Jasmine Rice is imported from Thailand and selected for its delicious flavor, unique texture and naturally distinctive aroma. Long considered to be the most prestigious rice in the world, it was named after the sweet-smelling jasmine flower and grown in the mountain highlands of Thailand for centuries. All of the flavors were wonderful! I think the Shiitake Mushroom flavor was my favorite on both the Jasmine and Brown rice. They are an excellent lunch for on the go. Rice n Simple products are also available in brown rice versions for a mild, nutty flavor that is rich in fiber and nutrition. All of the delicious varieties are an excellent source of complex carbohydrates, contain no preservatives and are trans-fat and cholesterol free. They also require no refrigeration so they can be stored in the pantry for easy week night meal prep or a grab ‘n go lunch alternative. Additionally, Rice n Simple’s rice and sauces can be used in countless rice recipes including those found at www.RicenSimple.com. Rice n Simple products are available for purchase online at www.Amazon.com and select Kroger locations in Georgia for MSRP $2.49-2.79. Look for availability in retailers nationwide in the coming months. Rice n Simple is a young company that is dedicated to providing its customers with an option for enhanced energy, flexibility and creativity by offering the highest quality rice in addition to the most deliciously flavored sauces for a healthy lifestyle. Rice n Simple was established on the philosophy that being healthy and eating healthy is essential to living a balanced, simple and harmonious life. The company strives to connect with its customers through one of the simplest things life has to offer, quality food; and with the simplest nutrient rich food in the world, rice. We like to have rice occasionally but sometimes it isn't convenient. How nice to be able to microwave it and have good taste and texture. I like that it comes in its own container.